Me, being an overachiever, decided that for our 2 year anniversary I would surprise the boyfriend with a scavenger hunt, ending with a picnic basket of baked goods and a mini bottle of champagne. Huckleberry is just a few blocks away from my apartment and is the end all and be all of baked goodies as far as I’m concerned. I asked them to throw one of their whole wheat shortbread cookies into the box of goodies going into the basket only because it was shaped like a heart and I thought I should probably put something “love” related in there. So later, after eating what I thought was the good stuff out of the box , I decided to give the cookie a try and I was floored at how delicious it was! Whole wheat! Amazing! I almost thought they must be lying, because I was sure that whole wheat doesn’t taste this good. 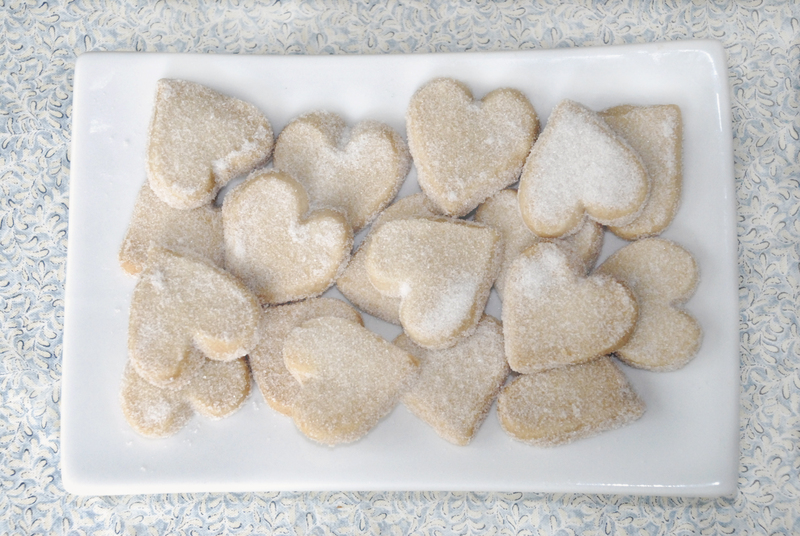 It added just a touch of warm nutty flavor that made the shortbread even better than recipes that use all white flour. Cut to a year and then some later and I was confronted with the task of bringing some healthy foods to a local harvest exchange. That was where the plum butter came in and these cookies came to accompany. I decided to scan the internet, thinking someone out there must have some vaguely close recipe for whole wheat shortbread cookies that come even marginally close to how delicious Huckleberry’s were. Lo and behold…the first recipe I clicked on was an article on Huckleberry in which the pastry chef gave their recipe for whole wheat shortbread cookies! Score!! Note: The original measurements for these cookies were in weight format, as that’s how most commercial pastry chefs measure ingredients. I bought a scale and measured them all out so you, my dear readers, don’t have to buy a scale–but that’s why the random measurements look so random. Also, these are extremely fragile cookies, so be warned that they don’t stack and travel well. Preheat the oven to 325 degrees; in a large bowl combine both flours and the cornstarch. Cream butter, sugar and salt. When you start out, it will be large clumps, then the longer you mix them, the lumps will get smaller and smaller until all of a sudden it will break and be a smooth batter. It’s the same magic that happens when you make frosting. Add the flour mixture to the butter mixture and combine, being careful not to over mix. Be warned that this is a very soft dough. Roll out the dough on a lightly floured surface to about 1/4″ thick. (I like to sprinkle a little flour on top of the dough and on the rolling pin as well–this dough is super sticky!) 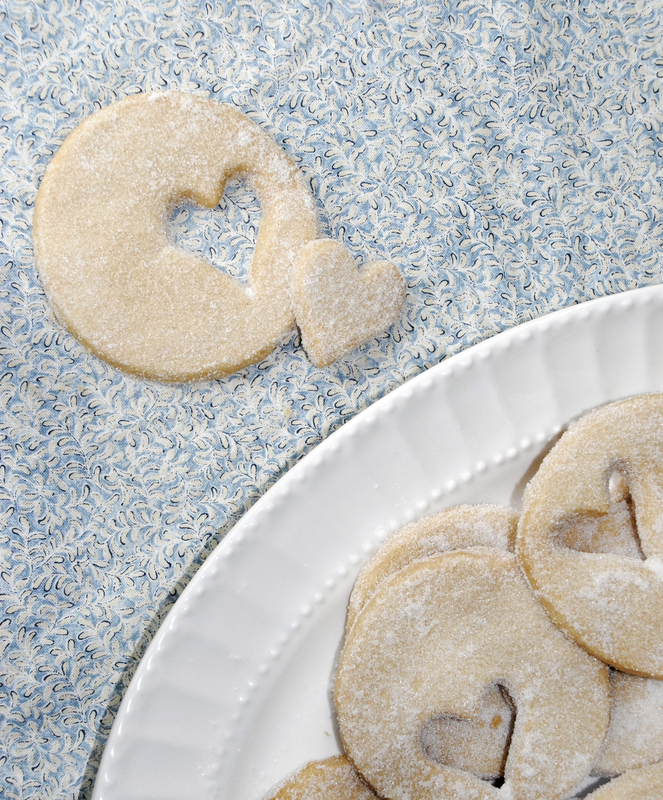 Cut the dough out with your choice of cookie cutters. Transfer shapes to a cookie sheet lined with parchment paper–cookies will not spread very much so you don’t have to worry about so much spacing between the cookies. Bake until brown around the edges–my oven did it in about 20 minutes. Remove the sheet from the oven and, without moving the cookies yet, sprinkle sugar over the cookies very very generously. After the cookies have cooled for a few minutes on the cookie sheet, gently (gently!) move them to a wire cooling rack. Enjoy the cookies while upping your whole wheat intake for the day!